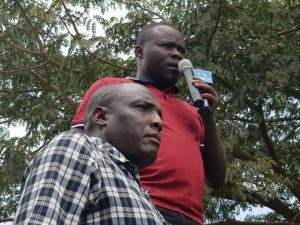 Federal Party of Kenya Migori senate candidate Eddy Oketch has castigated ODM leaders for linking him deputy president William Ruto. The attacks were started by ODM party leader Mombasa Governor Hassan Joho over his remarks linking him to the deputy president William Ruto. Addressing the press in Migori town today, the candidate said that he has no any links with the deputy president and he has been using the helicopter in his campaigns that many people feel is being funded by the deputy president. “The Orange democratic movement deputy party leader Hassan Joho is a selfish man who does not think of what I did to him last year when he was chased from Migori posta grounds and it is my car that he used to get out of the venue when chaos erupted,”he said. The candidate added that the ODM party brigade has been using a lot of propaganda to tarnish his image in order to win the votes of many Migori residents but the members of the public have been ignoring some of them. He said that he mounted the same type of campaigns last year using the same helicopter and nothing has changed in him and now when he does the same against the ODM party,the ODM luminaries are now linking him to being sponsored by the deputy president William Ruto. He vowed to conduct peaceful campaigns until the last day on Friday and he was sure that he will emerge the winner on Monday next week when the resident will go into polls.